First in Wah Region in Metric 1986. Gold Medal by The Minhaj University being first in Punjab Public Service Commission 1996. 1989 Matric Federal Govt. Boys High School# 7, Wah Cant. 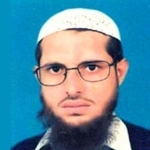 Minhajians are the alumni of COSIS, Minhaj University, the right hand of Dr Muhammad Tahir-ul-Qadri. They are struggling for the promotion of aims and objectives of Tehreek and this forum was established to polish their abilities, to organize their efforts and to create the second-line leadership of Tehreek.